I know that 95% of America have no idea what I am talking about when I say “SuperLiga”, but bear with me for a moment. SuperLiga is the annual tournament between Mexican and American teams. Each country is represented by four teams who are then split into two groups. It is a standard Fifa format. The four teams in each group play each other once and the two teams with the highest point total (3 points-win, 1 point-draw, 0 points -loss) move on to the semifinals. The Semifinals feature the winner of one group versus the runner-up from the other group in a one-game match, winner moves on. The winners of the semifinals play in the Finals in a one-game match to crown a champion. On Tuesday night, the New England Revolution defeated the Houston Dynamo on penalty kicks to capture their first SuperLiga title. Before I get to that game, let’s look at the semifinals. In the first semi, the Dynamo faced off against Pachuca CF from Mexico. The final score, Houston 2 Pachuca 0, does not represent what this game was like. With Houston leading 1-0, Pachuca had a goal taken back on an off-side call. Unfortunately, the linesman blew this call as there was no off-side. Arguments ensued, but the call did not change. A couple of minutes alter, Corey Ashe scored for the Dynamo to put them up 2-0 and ice the game. The game did not end on friendly terms though as Pachuca players stormed after the referees after the final whistle, determined to get payback for what was truly a terrible call. For a game to be lost based on poor officiating is not what SuperLiga wants. However, the awful call allowed for fans to see the passion of Pachuca players. Their anger after the game ended shows how much they wanted to win the tournament. For those people that think that there is no pride or passion in SuperLiga, think again. This is even more clear when you look at the second semifinal between the Revolution and Atlante. The Revolution came out on top 1-0 in the end, but that was not the main story. Having already gotten into a skirmish earlier this year in an exhibition match, the Revolution and Atlante players did not hold anything back. Two Atlante players were ejected in the game, both on plays where they took a shot at Revolution midfielder Shalrie Joseph. On both of those plays, the teams came together and pushed at each other before the officials could break it up. After the final whistle though, the real fireworks ensued. Players flooded into a fight at the center of the field and coaches swarmed in to try to break up the brawl, but it was to no avail. Eventually, Revolution players backed off, realizing they had more to lose in this battle. Four more red cards were handed out from this, including three on Atlante. In total, there were 15 cards in the match, six red and nine yellow. It was extremely hard-fought and each team left everything they had on the field. As I said above, if you truly believe that there is no pride in this tournament, then you really should take a closer look. 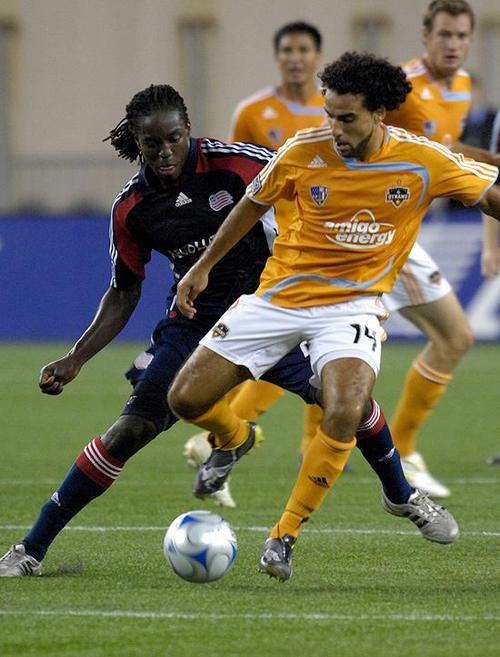 On to the finals: In the last two MLS Cup Finals, the Dynamo defeated the Revolution, once on penalty kicks, so no one was surprised to see these two MLS powerhouses meet in the SuperLiga Final. Before the game though, the teams showed a sign of unity when they agreed to split the prize money. Now this could have made the game less competitive, but the players chose to make the deal anyways. Why? To fight back against the league. If a Mexican team won the title, then the players received all of the million dollar prize, but if an American team won, the players only received 30% ($300,000) of the prize money. Not happy about how this was set-up, the Dynamo and Revolution chose to split the money, each team get $500,000 with the players receiving $150,000 of that. Now on to the game. I had the honor of being able to attend the SuperLiga Final and I’m sure glad I did. It was a well-played, hard-fought game and any soccer fan would have enjoyed watching it. The Dynamo opened the scoring in the 18th minute when Revolution defender Amaechi Igwe shanked a clearance opportunity right on to the feet of Nate Jaqua who fired the ball past goalkeeper Matt Reis to give Houston a 1-0 lead. The Revolution answered in the 41st minute after a nice run by Sainey Nyassi, Mauricio Castro lifted across over the Houston defense where Steve Ralston volleyed the ball into the back of the net. 1-1. That is how the game stayed until Extra Time. In the eighth minute of extra time, New England’s defense fell asleep, allowing Kei Kamara to receive a cross from Brian Ching and head it into the back of the net. Reis was late coming out on the ball and Igwe let Kamara cut right across him for an easy goal. The stadium quiet, the Revolution still managed to come back. Four minutes later Shalrie Joseph headed a free kick from Steve Ralston into the net to tie the game back up. Fighting for p osition, Joseph just got a flick on the ball, but directed it right into the side netting for the Revolution’s second goal. The frantic pace picked up and the crowd roared for the remainder of the extra time, but the game stayed tied so on to penalty kicks. 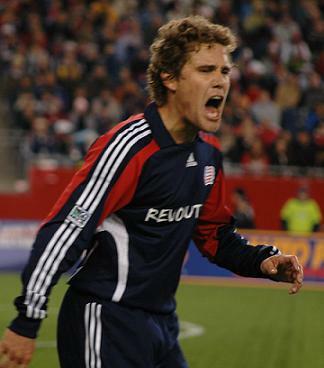 As I said, the Dynamo had defeated the Revolution in cup finals the last two years, including once on penalty kicks so the Revs really needed to get the monkey off their back. Things looked bad early when Matt Reis missed his penalty kick, giving the Dynamo a 2-1 lead after two shots each. Reis responded in the net, stopping the next two Dynamo shots to give the Revolution a 3-2 lead. Khano Smith stepped up for New England with a chance to win the game, but Houston goalie Pat Onstad made a huge, game-saving stop. The next six all scored giving the Revolution a 6-5 lead with the Dynamo’s Corey Ashe stepping up to shoot. 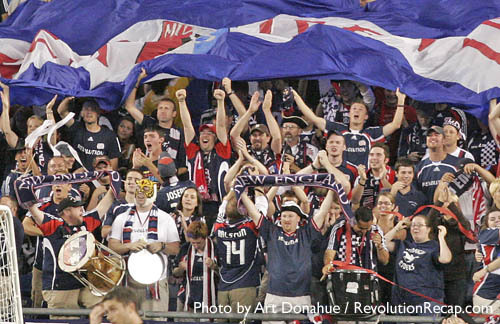 Ashe lined the ball right off the crossbar and the Revolution had won. The fans erupted in joy as fireworks went off and confettirained down amongst the 9000 or so supporters. Revolution players hugged each other on the field and exchanged jerseys with their counterparts, another sign of unity amongst the MLS teams. The Revs had finally won a meaningful game against Houston and celebrated merrily on the field. They paraded around the SuperLiga Trophy and clapped for their fans. The monkey was off their back. It was a tremendous final, filled with gut-wrenching plays and pressure-filled moments. In a tournament with four Mexican teams and four American teams, only American teams were playing in the finals. Next time you are flipping through the channels and see an MLS game on ESPN (once every millenniumor so), take a look at the game and watch for a little while. I guarantee you will be surprised at how good these players really are. It isn’t going to be the quality you see in Premier League games, but it will still be strong, competitive soccer, which is always fun to watch. Congrats to the Revolution on their SuperLiga title and on all those fans who have any clue what I’m talking about.